This entry was posted in Vacuum Tubes and tagged 12au7/ECC82, Westinghouse by tubemaze. Bookmark the permalink. This is a type of tubes that people do the rolling for. Rolling is a search of perfection that is practically never delivered with stock tubes. So the search starts and it’s hard to stop since there are so many tubes to try – an the mirage of the perfect tube is always on the horizon. I first discovered this tube when I bought an anonymous set of tubes on Ebay for cheap ($5 for 6 tubes). I started to plug the tubes in my amp and some of them were nice, some where not so nice. And then I plugged this tube in… I was blown away by the sound that was coming from my speakers. Everything was merged into a sonic bliss. Bass was very full and extended. Mid-rage was very luscious. HF was all present and very clear. This tube made the reality of an artist bring in the room through tube amp DOUBLE! This tube was able to produce the depth of sound that you get with RCA 12ax7 D-getter and musicality of Sylvania GB 5751. So why this tube is not very well known? It’s very hard to find and even if you find it you have to be careful what you buy. 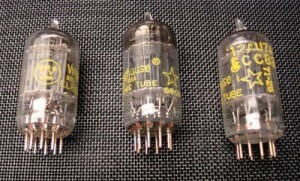 The tube was produced by Westinghouse for a short period of time and after that was sub-licensed from RCA, which didn’t produce the same sound. 1) Dots around 12au7 – not the GE type dots, but smaller dot’s in grayish color. 3) Silver cover above getter is very extensive (RCA’s is much smaller). This makes it really hard to see the getter. I mean super hard – if you can see it easily, it’s not the real Westinghouse. 4) Plates are not shiny black like RCA, but carbon black. Very unique color – it’s not similar even to Ken-Rad of the same period. It’s like charcoal – a mixture of black and very dark gray. This makes it very hard to distinguish them on pictures – because the color depends on lighting. 5) Yellow color letters with number 337 for the manufacturer – if you are lucky to get silk screen in good shape. They usually appear on ebay as Westinghouse or Conn, but always with Yellow letters. Received the first of two matched quad’s yesterday morning and went through Nick’s checklist to make sure they are legit (yup, legit on all fronts). Took out the Psvane’s and in went the Westinghouse Carbon Plates. Been playing them for most of the day, letting the system run when I’m not around to let them break in faster. First, they make the Psvane’s sound harsh and one-dimensional. I’m not sure how to best describe the westinghouse tubes because they’re pretty solid in every category. It’s like a team working together with each playing its part to make the total package super awesome. Balanced, clear, sweet, and very MUSICAL. They let you sit back and enjoy the music without distraction, over-thinking or fatigue. Great tempo and great sound. Love them.. Continuing to listen to these…they have excellent soundstage and depth, with the music extending far out in front of the speakers. The tone is very sweet and present. The bass is just awesome. The separation of instruments playing simultaneously is the best I’ve heard. These things are like crack. I was all about the CV491 Mullard Short Plates for a few days, but the Westinghouse tubes just came in and smoked them. Agreed, BEST 12AU7 EVER PRODUCED. Same as 1st poster, had 1 I got in estate sale bargin, makes me want to sell all my others in order to buy more of these. No matter what preamp circuit, what system/speakers/headphones, this tube delivers. I cover everything in my listening from classical to Tony Mottola, electric blues/blues, classic rock, electronica/new age, jazz, country, big band, rock and metal, this tube does them all with such perfection it as if god himself created this tube. Can’t say that about any other tube, not even about my previously preferred Mullards. The others all seemed to have strengths and weaknesses depending on what and where your listening, not this tube, there is no weakness. It drops you right in front of musicians/vocalists/orchestras as if they are there playing for you in person. Highlights every string whisper, vibrato, snare/cymbal hit, bass slap and adds that tube goodness but without overdoing anything. Never fatiguing, always in perfect balance. 1st song I tried with was Deep Purple’s LAZY, one of my favs for many years. It’s was like I had never really heard this song before even though i’ve heard it 100’s times over the years. Billy Joe Walker Jr.’s Painting Music CD, Queen’s We Will Rock You, you will here little details that never really stood out before.